Today we look at another aspect of building healthy, vibrant garden soil that is not only incredibly productive but provides pest and disease resilience. Conventional commercial farming and gardening has mainly paid attention to three elements for the past 65 years or so, pretty much to the exclusion of all else. These are N- Nitrogen, P- Phosphorus, and K- Potassium. You see these in ratios on fertilizer bags, hear about them in conversations about amending the soil and see them pointed to when troubleshooting growth or production problems. Commercial biological agriculture has found that there are many more minerals and trace elements that are extremely important to the growth, health and productivity of the soil as well as the plant. Some of these are Boron, Silicon, Calcium, Magnesium, Carbon, Potassium and Copper. These are not all of them by any means. By most research, there are about 70-80 minerals and trace elements that are critical to the full development and health of most plants and crops. For instance, a tomato’s nutritional profile includes 56 minerals and trace elements! This is one of the reasons that commercial farmers use the tomato as a benchmark to test the vitality and nutrient content of their soils, as the tomato is “hungry” and needs many nutrients to grow properly. The true test, however, is not limited to how the plant grows, how healthy the leaves are, how many flowers and fruit are set, but how the tomato tastes. If the tomato tastes rich, is juicy and has a complex flavor, then the soil is healthy. If not, then some work remains to get the soil to it’s optimum condition. Minerals and trace elements are being studied much more now, as many people in agriculture begin to realize that without replacing the minerals and elements taken up by the crops yields begin to decrease, nutrition content drops and pest and disease resilience is lower over time. Studies have shown this for the past 30 years stating the nutritional content in many vegetables have decreased as compared to those of the past. Using a biological and organic method of growing helps, as the manure based compost has several of these mineral and elements, but not nearly enough. Self-sustainable, old time farming had many manure inputs to the compost pile, from different ruminants that contributed microbiological activity to non-ruminants that added finely chopped organic matter. These were better, but still did not address all of the minerals and elements needed for healthy soils. Two sources are readily available and usable for the home gardener to restore the minerals to the soil. One is sea minerals, the other is volcanic rock dust. Sea minerals are just as they sound- dried seawater. Many commercial farmers are using sea minerals to restore the mineral balance, some using 2200 pounds of sea minerals to the acre! That is just over a ton per acre. My concern with using sea minerals for the home gardener is the salt content, and the potential damaging impacts that salt might have. The second source- volcanic rock dust has no salt and is composed entirely of minerals. Thus there is less danger of over use causing catastrophic damage to your garden! This article introduces volcanic rock dust in a product known as Azomite. This is a commercially available product, and we have no affiliation or connection with Azomite. They don’t even know we are writing about them! We use this in our gardens, and are using it to “charge” our charcoal in our compost piles, just like we wrote about in the last blog post. We won’t write about or recommend something that we haven’t used ourselves. This is the introduction, the second part of this post will be a discussion and examination of how and why it is so effective. The article is graciously provided as a reprint from Acres USA. Like so many young people, Jared Milarch was in a hurry. At age 13, Jared began transplanting native sugar maple seedlings out of his family’s woodlands in northwest lower Michigan. Thinking ahead, Jared planned to sell them as street trees to pay for his college education. Watching this investment in his future creep skyward, Jared wondered how to speed these trees up — grow taller faster. “I got impatient because the trees weren’t growing fast enough,” Jared admitted. About this time, Jared read Secrets of the Soil by Christopher Bird and Peter Tompkins. One chapter described a fertilizer that stimulated plants to remarkable vigor. This “miracle” plant food is a powdered pink clay from central Utah named Azomite, an acronym: A-to-Z Of Minerals, Including Trace Elements. It also goes by the name montmorillonite ore. I asked Jared what Azomite is. “Ground up sea floor bed from Utah mines,” he replied. “They grind it up talcum- powder fine. I guess it’s easier for plants to digest then.” “And for the microbes, too,” added his father. “Because plants don’t really take up nutrients in their root hairs, but from dead and living bodies of microorganisms that ingest the minerals.” Azomite is, in fact, a unique mineral deposit with special biological character. In ancient geologic times, central Utah was an inland sea. Water washing off then-young Rocky Mountains was rich in minerals, and, over eons, this body of water evaporated and shrunk, until today only the Great Salt Lake and Great Salt Desert remain. Bacteria living in this inland sea ate the minerals, then excreted them in oxidized, hydrated and blended forms. The microbial manure accumulated on the sea floor. This sediment has an abundance of over 60 elements, not just three or four, or a dozen. “I didn’t have a lot of money, so I kept bugging my dad to order a few bags,” remembered Jared. “He reluctantly gave in. When the bags arrived, I sprinkled two tomato soup cans around each baby tree.” After 100 trees, his bags were empty, so his other 400 saplings got none. The next spring, Jared watched his unfertilized trees grow 12 inches. But the Azomite-treated trees grew fully 3 feet in one spring spurt! In Jared’s years working in his family’s shade tree business, this was unprecedented beyond imagination. His father David — a third-generation nurseryman in this remote corner of northwest Michigan — took notice of Jared’s fertilizer results. In 1996, David decided he had seen enough financial gains on his tree farm, and read enough evidence, to become an Azomite distributor. Soon the Milarch barn was stacked with bags of pink Utah dust. David Milarch, with decades experience in the family shade tree business, founded The Champion Tree Project. The effects of Azomite on his tree farm urged him to require that every champion tree must be sold and planted with rockdust. In 1997, Jared — a fast-track senior honor student at Benzie Central High School — enrolled in a botany class in Michigan State University’s Horticulture Extension Program at nearby Northwestern Michigan College in Traverse City. a controlled experiment in the college greenhouse to instructor Kirk Waterstripe. Jared insisted this new idea was worthwhile, so Waterstripe relented and assented. With advice from his professor and father, Jared designed an experiment to test the effect of Azomite as a soil supplement on tomatoes. Jared’s very simple, but controlled experiment would clearly show any effects from Azomite. Eight tomato plants (“Fantastic” variety) of uniform size were grown in 1- gallon plastic pots, in a mix of standard potting soil with 6 tablespoons of composted cow manure. Two tablespoons of Azomite were added to the soil of four tomato plants; the other four had no clay mineral supplement. The plants grew in uniform greenhouse conditions from June 17 to Sept. 9, got 150 ml of water three times a week, and were rotated in the greenhouse to ensure equal exposure to warmth and light. Height was measured from soil surface to uppermost branching point. All measured 30 cm at the experiment beginning, with no visible differences in health. After 67 days, the tomatoes fed Azomite were easy to distinguish from untreated vines. On several measurable characteristics, Azomite yielded a better plant. Everyone agreed all four plants fed clay dust looked bigger and healthier. • Average height of Azomite-treated plants was 98.5 cm, compared to 89.75 cm for control plants. 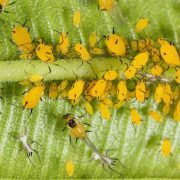 • Whiteflies were found on both treated and control plants by day 28. After day 42, insecticidal soap was sprayed to control whiteflies. But treated plants had much less damage, defined as “honeydew” — sticky, sugary excretions by whiteflies. • Azomite-treated plants flowered earlier, more prolifically. • First tomato was on an Azomite treated plant on Aug. 26. • Treated plants set more fruit. But from this modest understatement issues a bright light of insight. The implications of this simple experiment could alter farm economics, food production and horticulture methods. Only four plants, but a solid, significant four versus- four superiority. This clear, consistent result confirms a long list of field observations. Definitely, this Utah powder provides some nutrient lacking in greenhouse potting soil — and northwest Michigan topsoil. Something so essential that just a trace of it effects significant gains in growth, vigor, sturdiness, color, flavor, flowering, fruiting, and pest resistance. Tests of this remarkable result should be repeated not just by one observant and thoughtful high school senior, but also by other universities and high schools in many different locations. to write his own paper for a science journal, and wants to test Azomite on other crops. The professor is even considering writing his doctoral thesis on this trace element effect. Jared, David and Waterstripe all discussed with the financial potential of early flowering for farmers. monetary quantity or economic values. Reproduction is the climax in a plant’s life cycle. Any substance that triggers such an increase in this activity activates and fulfills the plant’s full life potential, and is a near ideal and essential plant food. In an ecosystem, this climax is an outburst of ecstasy as nature rejoices in this peak experience. This isn’t mere substance, it’s essence. I weary of experiments to repeat what we rediscovered a decade ago that was discovered by others over a century ago. How many academics and scientists have to see the facts before serious research begins? We need experiments to learn, not “if,” but “how” mineral powders restore soil fertility and boost plant vitality. Decades of research by dozens of investigators clearly show this happens, but we still have only fragments of real insight into the secret lives of soil that accomplish this miracle of minerals transformed to living cells. I asked Jared what he thinks causes Azomite’s remarkable effects. 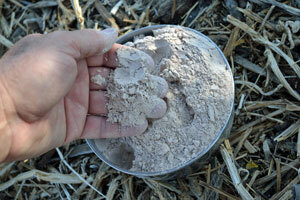 I pointed out that a few tablespoons of clay dust doesn’t supply much nitrogen or potassium. What minerals might this Azomite be feeding trees and seeds? Whatever substance or essence Azomite supplies, it boosts overall vitality and quality of tomatoes — for seemingly every plant it is fed to. One Michigan news reporter in 1996 headlined Jared’s discovery as “Tree Vitamins” — botanical equivalent to one-a- day health pills. The Milarchs’ positive results have been followed by an expansion of Azomite use. I asked Jared what he will do with his new insight into soil fertility. David Yarrow is a frequent contributor to the publication Remineralization of the Earth, now merging with Acres U.S.A. He has written extensively on the environment, macrobiotics and Native American issues. In the next post, we will continue the discussion and examination of the benefits of restoring the minerals to your gardens soil. Stay tuned! Thanks for posting this valuable info! I’m on the same trek, trying to restore fertility to very depleted soil in southern MD. Do you test your soil to determine how much azomite to apply? What’s the usual recommended application rate? Thanks! Thanks for the kind words! Here is the link for the Azomite application rates- http://www.azomite.com/index.php?option=com_content&view=category&layout=blog&id=29&Itemid=55. when he cuts the stone to size with a diamond saw. This dust is great for gardens and shows results in a few weeks. There are several sources of rock dust, many are not in the mainstream mindset of folks. Thanks for showing us another source! Just used a bag of Munash rock dust. Believe it to be basaltic origin tailings. Don’t overlook lime/gypsum/dolomite just because you start using rock dust…check the analysis. Be very careful using granite source rock dust, as granites are somewhat radioactive. A dust form would be especially bad i think. Check the wikipedia article on granite. Thank you Chris! You make some good points on looking “outside the box” for minerals suitable for a garden. Hello Ted- Azomite is available at a number of places in California, see this link – Azomite Sources to see who is closest to you. Thank you so much for your wonderful praise! We are happy we happened upon your great website and would like to share this article with our facebook fans. You are welcome Mila! Thanks for the thought of sharing us and our information with your audience, we really appreciate it. Thanks for this great article! 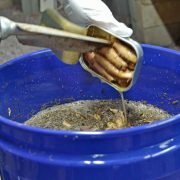 I tried Azomite at my garden and my mother-in-law’s, and we were both REALLY happy with the productivity. My fruit trees and berry bushes bore larger crops than ever! Appreciated learning about this! Good to hear Lee! I’ve not had anyone come back after trying Azomite and say that it didn’t work! Almost every soil we are working with today will greatly benefit from re-mineralization. I’ve added marble dust from regional quarries and purchased greensand before but just applied Azomite for the first time yesterday in my backyard garden. I’ve long believed that commercial vegetable growing operations needed to replace more than NPK. I also just received some glacier dust… figure it can’t hurt! :-) Looking forward to seeing the results! Your thinking is right on track Brad! 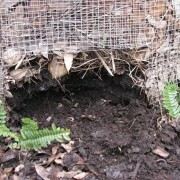 Re-mineralizing the soil will improve many things in the garden. Let us know how your garden does this year! Wondering if you have heard of using the mineral deposits that are left at the bottom of a water heater in a hard water area. Would these be harmful or problematic in any way you can think of? I am planning to work them into my garden soil but wanted some opinions from others, first. I would not use those mineral deposits, as they are adding to the mineral load that is in the water and already being put into the soil. They can cause issues with pH and other mineral availability. Thanks for your work for the soil and climate. i’m from Cameroon in Central Africa region and I’m working on climate change. I would like to exchange with David Yarrow that I have been looking for for more than 10 years. We had an exchange for sea mineral but he disappeared and I wonder if he is again alive. I have been told that he is not well, but I’m very happy to see his name on an event of February 5, 2014. Please I’m looking for any information concerning him. I would like to import sea mineral in Cameroon and I need some sample to obtain official autorization to conduct an experiement. David’s email is dyarrow5@gmail.com. He is very much alive and active, so contact him and continue the conversation! Good to hear what you are doing, we need more of us working to make our world better. Biochar is an excellent carbon sequestration tool. It also helps for soil quality improvement. Make sure to read our Terra Preta article on biochar – Terra Preta part I and Terra Preta part II. We will find the way to establish a partnership. 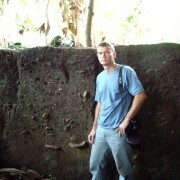 About David Yarow, could you please give me some information about him? I new him through my adoptive mother Clare danielson from Newyork who had pass away some 04 years ago. Hope to year from you soon. Michele, use David’s website – CarbonSmart – to get more info on him and what he does! I hope this helps. The book makes for interesting reading. Several years ago, I ran into this information and began my own investigation into rock dust. Somewhere along the way, I ran into a matter of concern regarding Azomite and that is that it contains arsenic. I am not sure whether there is enough to matter, but due to that concern, I began using Gaia Green Glacial Rock Dust (from Canada) which I purchase here in California from Peaceful Valley Nursery in Grass Valley, CA (GrowOrganic.com).At this point, several years later, I am sure that I would have had the same good results that I have experienced with Gaia Green by using Azomite instead. In either case, rock dust is a great additive to improve the soil. I add rock dust for every plant that goes into the ground. Reportedly, the rock dust doesn’t require replenishing every year as commercial fertilizers do due to the action of precipitation. It is suggested that one add rock dust to the soil every three years. Thanks for the update and resources John!